Will the bunker remain maintained? False sense of security resulting in declining home defesibility. When do you enter the bunker? Can you get to the bunker? Lack of standards and seems (to me) to an immature/unproven technology. How much air, how long can you stay inside, what if the bunker is full of smoke? I certainly do not think that community 'safe houses' or bunkers are a good idea. If a community does not 'leave early' I doubt there is any chance it can get to a community shelter 'when things get bad' (too late). 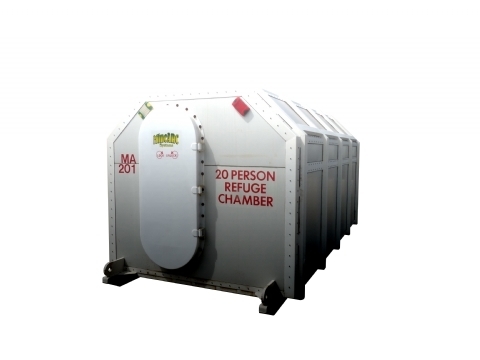 The MineArc and Wildfire Safety Bunkers inspire confidence. I'm sceptical about the rest. There are heaps more … and many look dubious for me. I'm no expert, this is my opinion. I'm worried that during a fire passover trees may fall over the bunker blocking the exit. I notice that Wildfire Safety Bunkers mention a hydraulic door option to assist. Otherwise I would want the door well clear of trees or structures (hmm … how do you get to it?). Impossible at our home as we are surrounded with tall trees. The bunker is a backup. A last resort. A fire can come very quickly, I'm not going to spend very fire risk day sitting in a bunker. So, I'm working on tbe belief that I would enter the bunker when a fire passover is in progress or it is clear that attempts to defend are failing. This means that visibility will be poor due to smoke and there may be high radiant heat (moret than 20kW/m2) surrounding the house. So how do we find the bunker and survive the transition? Hmmm … I do not know. I'm think that survival time will depend on ability to withstand external temperatures and available air. I believe that since entering the bunker will be a last option during a fire event, opening the door will means that the bunker will probably be filled with at least some smoke. So I like the idea of breathing masks rather than assuming that there is enough air in the bunker. I've got to get more info on this. I'm not aware of any standards / tests / or survival stories from current products offered by vendors. I do not put a lot of value in survival stories as my interest is not in others luck but our survival probability. I note that Wildfire Safety Bunkers say they are seeking CSIRO testing. MineARC in their submission to the bushfire royal commission provide list heat from occupants (metabolic body heat). This is a concern, but I do not know if the test results would be significantly different if the chamer was buried (I do not know the full conditions of the test).